Imagine a beautiful crescent shaped lake, with the most amazing turquoise colour you have ever seen. 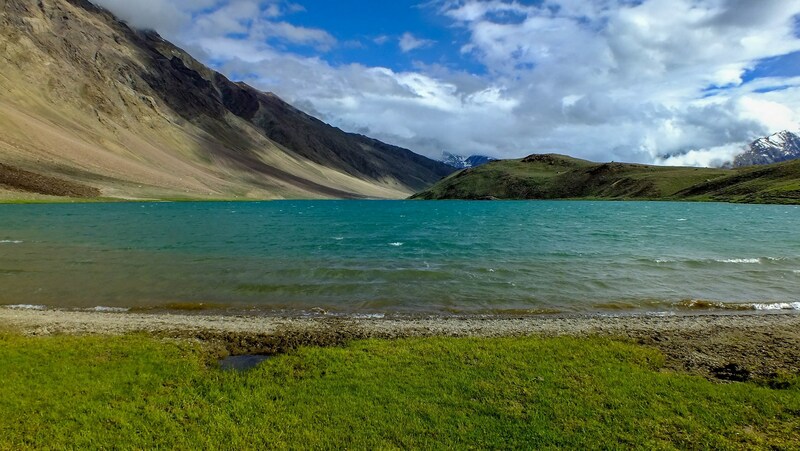 It is difficult to not feel euphoric, as you view Chandrataal lake from different angles – and different colours – as the sun plays hide and seek above. It is one of the most romantic places we have travelled to, where all we wanted to do is sit down by the lake, side by side, resting heads on each other – and keep looking at the waters in front of you. It is in places such as Chandrataal, that you finally understand the magic of the mountains. Older travellers swear by the magic of the Himalayas, and I think we have also begun to feel that there is something beyond just beautiful sights that attracts travellers to these heights year after year. 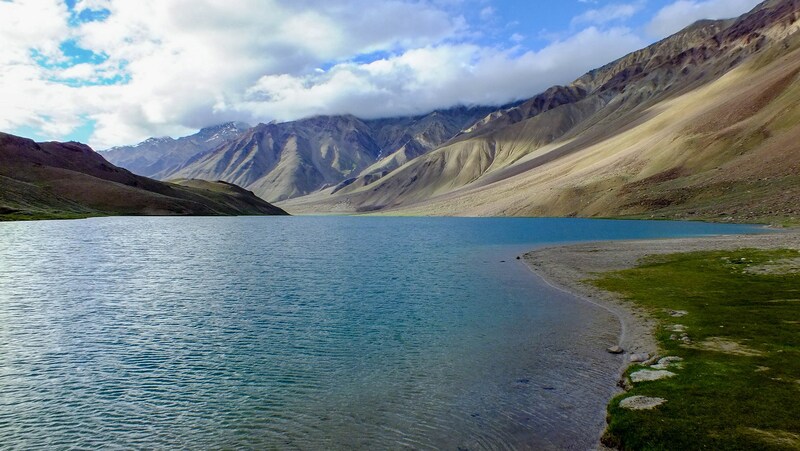 Our desire to come to Spiti was kindled on our Ladakh trip in 2012, when we had come across Surajtaal lake in Lahaul. 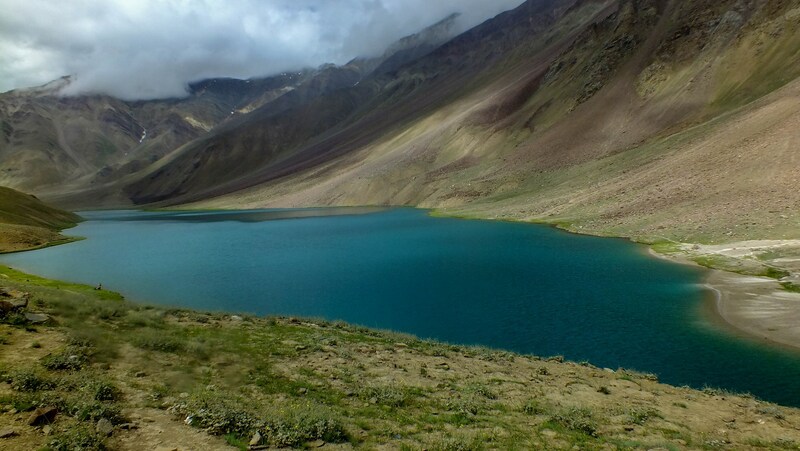 The tranquillity and beauty of Surajtaal made us resolve to visit it’s sister lake Chandrataal someday. Chandrataal falls in Spiti Valley in Himachal Pradesh, part of Lahaul & Spiti district. Spiti river is a tributary of the Sutlej river, and the namesake valley is an isolated valley, cut off from the rest of the country for 8 months a year. The average elevation is about 11,000 feet and it is a cold dry land just like Ladakh. Population is very sparse, about 5,500 people in the entire valley. 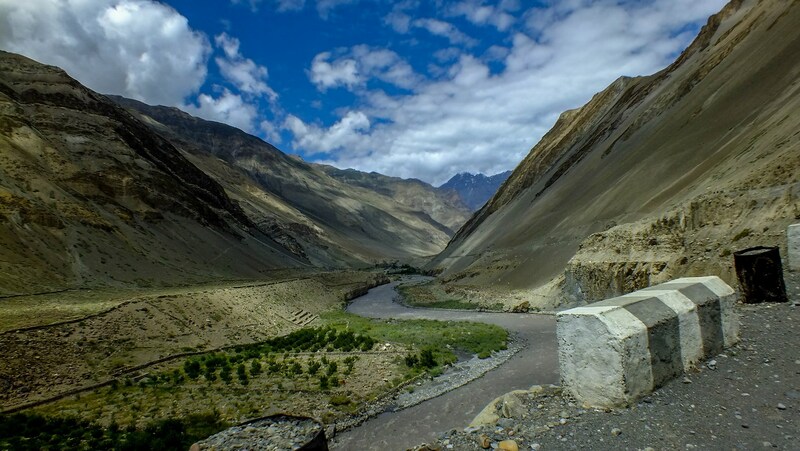 Similarity of the terrain with Ladakh is a given, but Spiti valley is more untamed and raw. The roads are mostly broken, narrower and with much less traffic. On some roads, it would be hours before we saw another vehicle. Food options, accommodation, tourism facilities & cellular network are all much less available in Spiti Valley than Ladakh. Consequently, the number of tourists also were meagre, and predominantly foreigners. This has some benefits too, as Chandrataal is not overrun by tourists, like Pangong is nowadays. There are two ways to approach Spiti Valley. 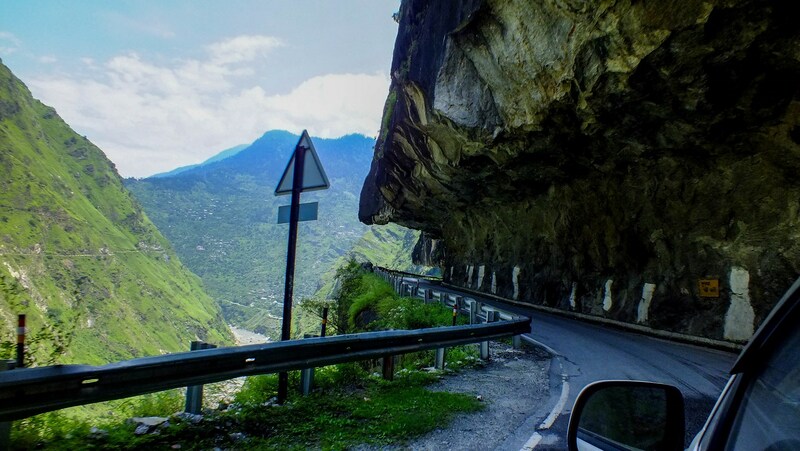 The more common route starts at Manali, and goes through Rohtang and Kunzum high passes. These passes are opened only in summer (May end) and are closed by snowfall in the beginning of October. The second route starts at Shimla, and goes through Kinnaur Valley to reach the other end of Spiti Valley. This route also ices over during winter months. We chose this route to enter Spiti valley because the climb to higher altitudes is gentler. The Manali route takes you to the 14,000 ft Rohtang and Kunzum passes on day 1, making you vulnerable to AMS (acute mountain sickness). It was our first visit to Chandigarh and we were impressed by the city – very neat and well maintained, people following traffic rules, pillions wearing helmets etc. The first 20-30 km outside Chandigarh, was a really nice 8 lane toll road called the Himalayan Expressway. After that, the road becomes a regular 2 lane road up the hills, albeit in very decent condition. Traffic was moderate to heavy all the way to Shimla. Not an overtly memorable day overall. Destination for the first day was a small town called Narkanda, about 60km ahead of Shimla. 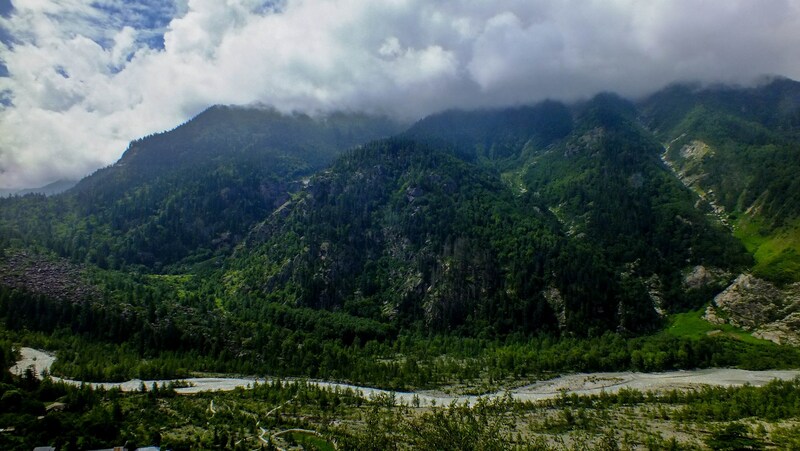 Narkanda is the start of Kinnaur Valley, the famous apple-growing region of Himachal Pradesh. 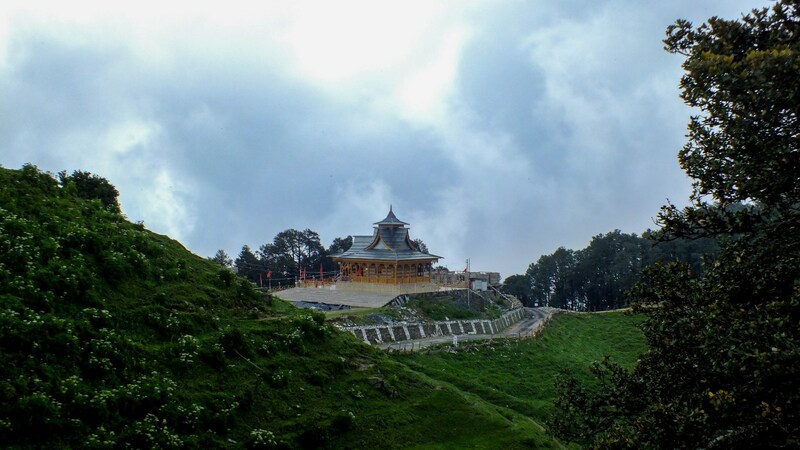 It is a picturesque hill station on its own, minus the bustling crowds of Shimla. We were staying in The Wilderness resort. It is a charming resort set within an apple orchard, overlooking a small lake on one side and a green valley on another. The resort was expensive, but the suite that they gave us, along with the wonderful dinner and breakfast, was well worth the Rs 5000 they charge. The next morning we visited Hatu temple, a famous shrine nearby. Nestled at the top of Hatu Peak, it offers some splendid views all around. We did have a freaky visit though, as there was a exorcism session starting just as we reached the place. The screams from the ‘possessed’ lady did unnerve us a little. But we soon found ourselves a spot away from the temple to have an unadulterated view of the Himalayas. 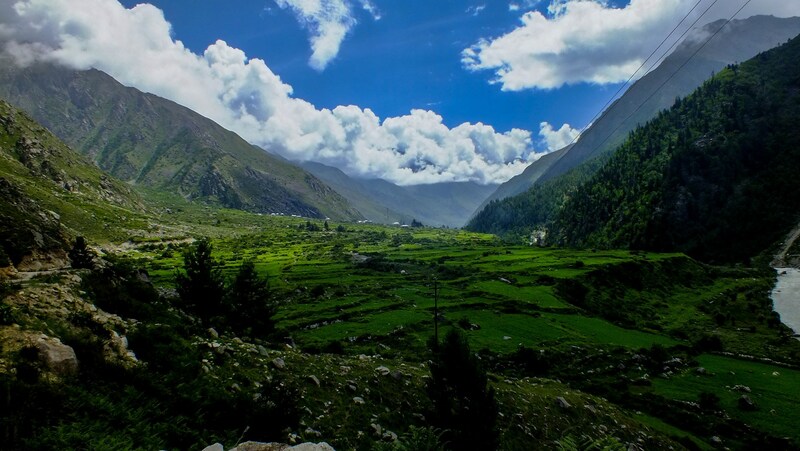 Sangla is a small village deep inside the Baspa valley. As picturesque mountain villages go, Sangla is an idyllic one, but the cherry on the cake is the beautiful campsites along Baspa river. These swiss luxury tents, with attached baths, are located usually amidst apple orchards, right next to the river. 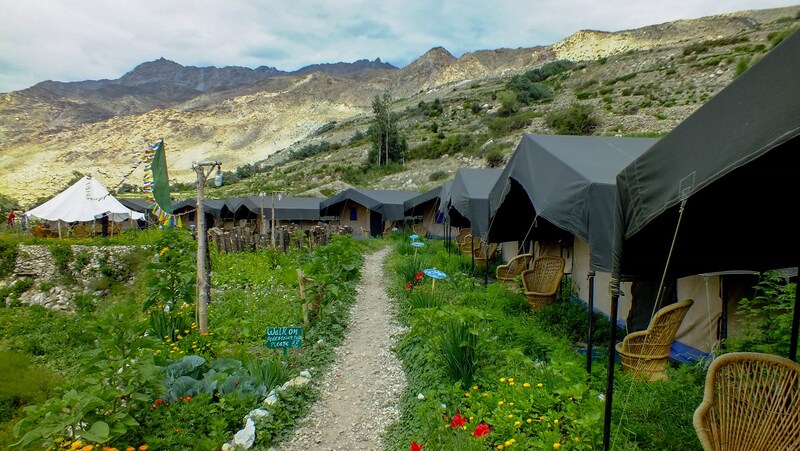 There are quite a few options in and around Sangla, with Banjara Camps being by far the best located. We stayed in Apple Orchard Camps, next door to Banjara. Surrounded by apple trees, it made for one hell of a picturesque campsite. When the village of Chitkul comes into view, you can see steppes cut into valley, lush green with crops and houses peeking in here and there. As you roll into the village, it is the epitome of a typical Himalayan village, hardly 20-30 dwellings. The fields are usually planted with potatoes or peas – the only two crops that grow well at this altitude. There is a trail down to the river itself, where you can find some rocks to sit on and watch the river burble by. Everything around you in so clean and fresh, if you happen to think back about home, it is astonishing how grimy and polluted Mumbai is. Chitkul is the end of the road in Baspa Valley. So we backtracked past Sangla into Kinnaur Valley and the Sutlej river, towards our next destination Kalpa. 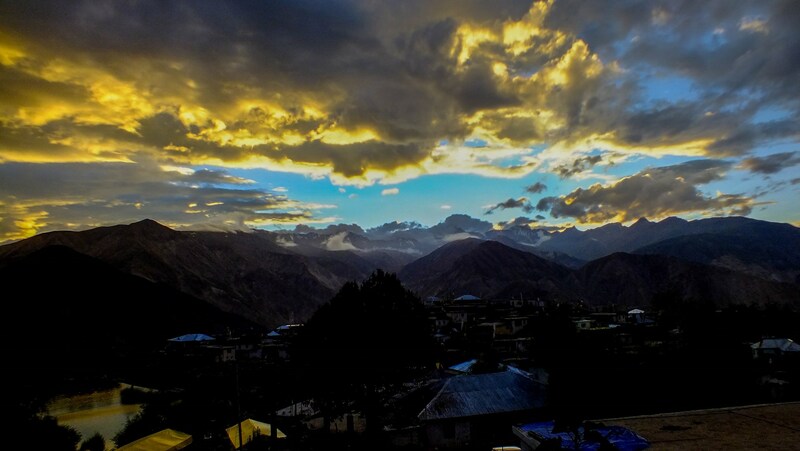 Reckong Peo is the district capital of Kinnaur and is a somewhat bustling town in the mountains. Kalpa village is situated higher above Reckong Peo, 15 km away. It looks over the Kinnaur Kailash mountain, a 6500m snow covered peak that has some religious significance (not sure what though). 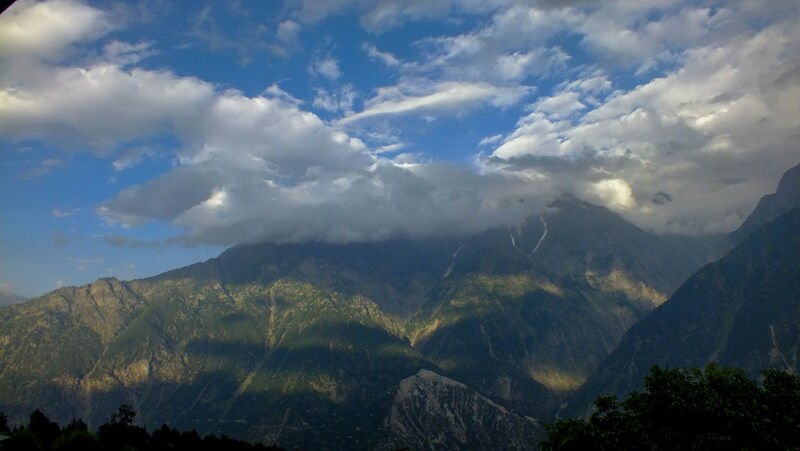 What we can tell you is that the view of the mountain from our balcony in Kalpa was fascinating. With clear weather, and clouds playing hide and seek with the summit, it was a fascinating hour of mountain watching. Temperatures dropped significantly once the sun went down, but our Grand Shangrila hotel was very comfortable and luxurious. The steaming hot dinner of soup, momos and noodles were especially soul satisfying – and the staff was enterprising enough to source for us a local liquor made from apricots. It was much better than Goa’s feni, but it was still quite strong and unrefined. But given the temperatures in the region, we are sure it is very useful in its current potent form. The next day of travel was the most unexciting of the trip as all the green of the Kinnaur Valley vanishes and the whole valley becomes lifeless ochre and browns. The Sutlej river itself continues to be grey-brown and the road, according to our driver, is the most precarious of the whole trip because of frequent landslides. There were even helpful signboards put up by the Army saying “You are travelling on the most dangerous road in the world”. We were lucky to meet only one small rockfall, but it was part of the ongoing work to make the road wider. And there was an excavator nearby which cleared the road quickly. 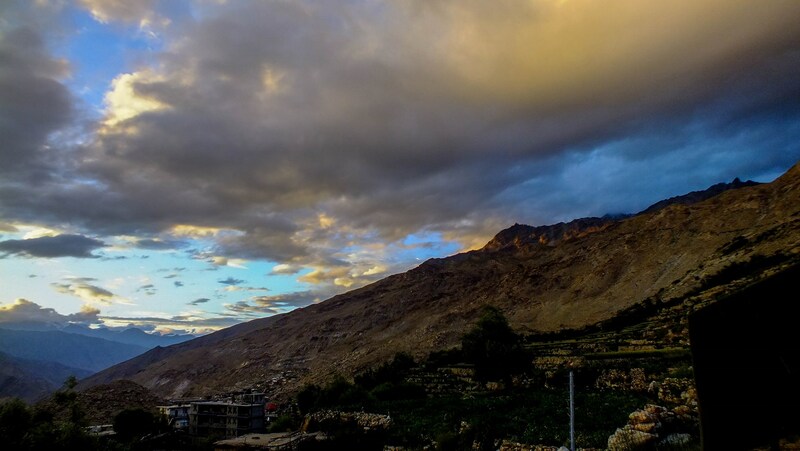 The change from Kinnaur to Spiti valley happens at Khab, where the Spiti river meets the Sutlej, and where a bridge over the Sutlej river leads us to Spiti Valley. If it sounds momentous, it is not actually. It is a small bridge, without any fanfare – and there is nothing around – no signboard, no police/army presence, or any sign of habitation altogether. Just the ever present prayer flags, fluttering in the wind. The climb to Nako is steep, going through a series of zig zag loops, called the Ka Zigs. In just 30 min, you gain an elevation of almost half a km. Nako is a small village around a spring fed lake, at 12,000 ft. There is a monastery etc, but the charm of Nako is staying at Kinner Camps, overlooking the lake. We have stayed in a few tent sites during our travels so far, but I cant remember a cuter campsite than Kinner camp in Nako. There are a row of 11 luxury swiss tents facing the lake, with a common garden in front. The garden has a firepit for the evenings and a beautiful gazebo with bamboo chairs underneath for guests to sit and chat. We stuck up conversation with a group of riders from Mumbai, who were doing an organized trip on their Bullets. But as the sun started to go down, all conversation stopped and we all just stared at the setting sun, our jaw dropping at the sheer beauty of it all. The high altitude and the clouds made the yellow and reds reflect magically all around, while the blue sky could be seen on the fringes. These photos below do not even begin to do justice to the sunset we saw that day. Next day, we headed further into Spiti valley. Tabo is the second biggest village in Spiti and the site of a big monastery – apparently the oldest continuously operating monastery in India (from 996 AD). 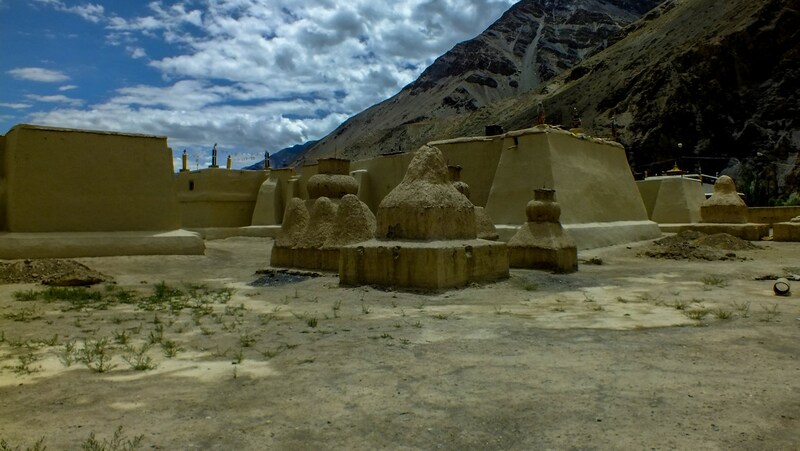 The build of Tabo monastery is very different from the others in the region, with the stupas made out of mud, not stone/wood like the rest of the region. And the stupas are square, not round. The look of the mud buildings is not unlike that of the famed Timbuktu. Also unique to Tabo are the small caves spread around the hills. These caves were used by monks for meditation. The main monastery also has beautiful frescoes on its walls inside, not unlike the famous Ladakhi monasteries like Hemis and Thiksey. 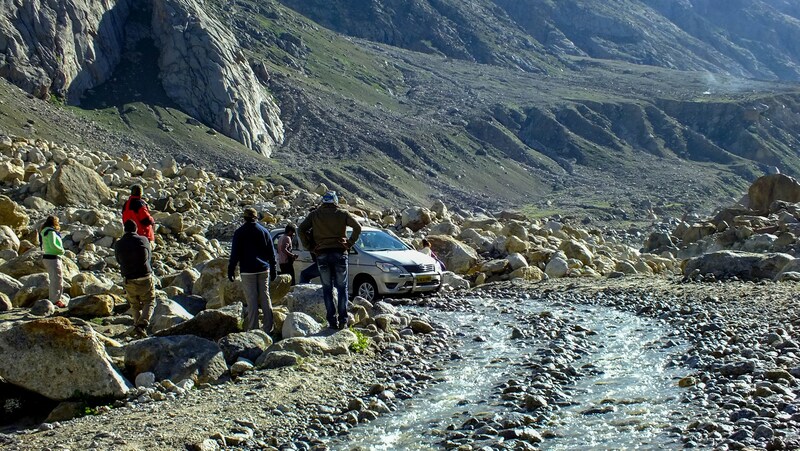 We drove further along the Spiti river to Dhangkar. 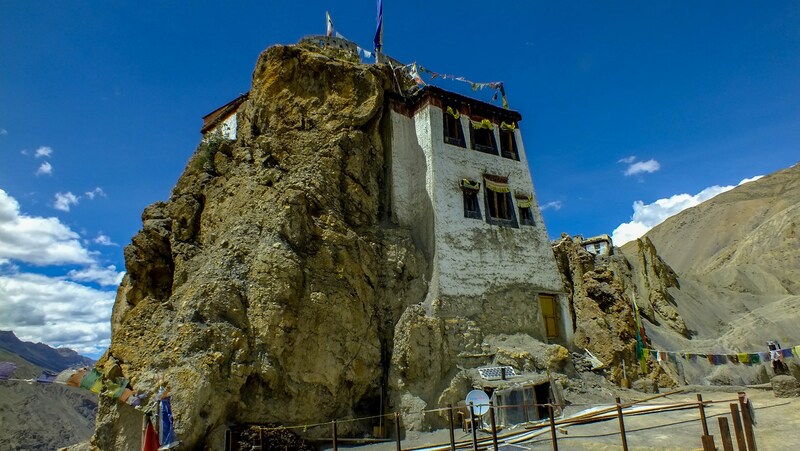 Dhangkar Gompha is a spectacular looking monastery, perched high on a cliff overlooking the Spiti valley. The word Dhangkar means “fort on a cliff”, a very apt description for the place. However, the gompha isn’t in very good shape and there are prominent posters asking for donations to keep the monastery from collapsing. The monastery isn’t very big, with steep stairs leading up to a small prayer room. It isn’t very rich in wall paintings or thangkas either. But it offers a breathtaking view of the Spiti river and the entrance to Pin Valley. An offshoot of Spiti valley, Pin Valley is better known as Pin Valley National Park – home to the endangered snow leopard and Siberian Ibex. It is supposed to be a really beautiful place, with minimal human population. 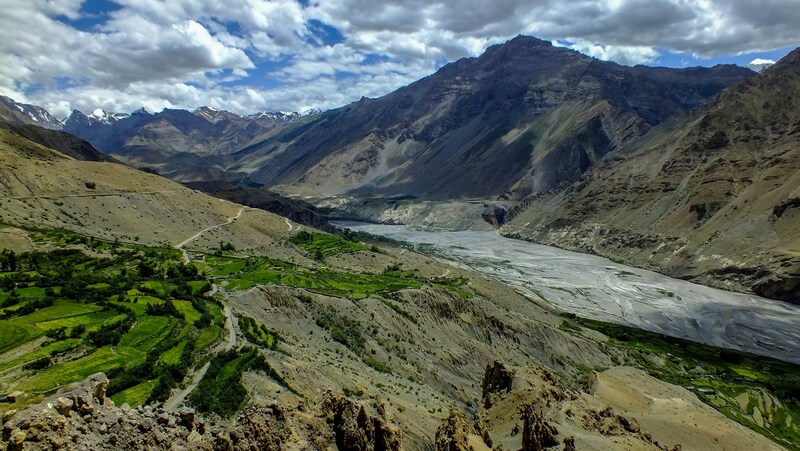 Think of Pin valley in Spiti like what Zanskar valley is to Ladakh. However, the washing away of a bridge at Atargu prevented us from going to Pin Valley. It was disappointing, but then we still had so much left to see. Most of Kaza is hotels (mostly small), restaurants, cafes or shops catering to the tourist trade. 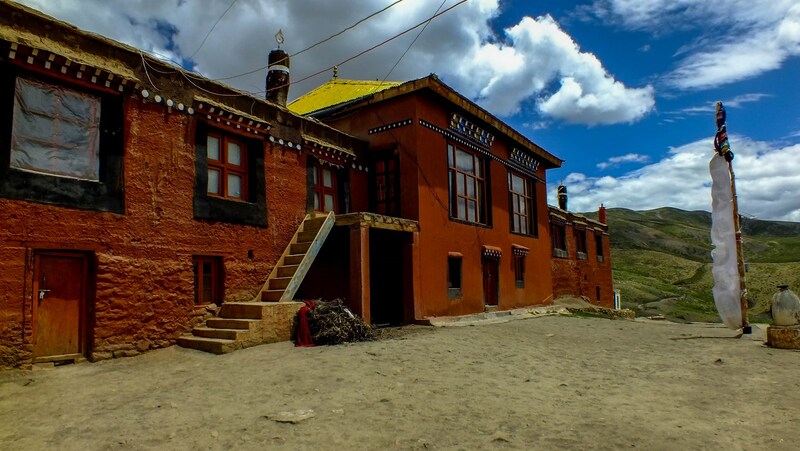 We stayed at the most well known hotel in Kaza probably – Sakya Abode. 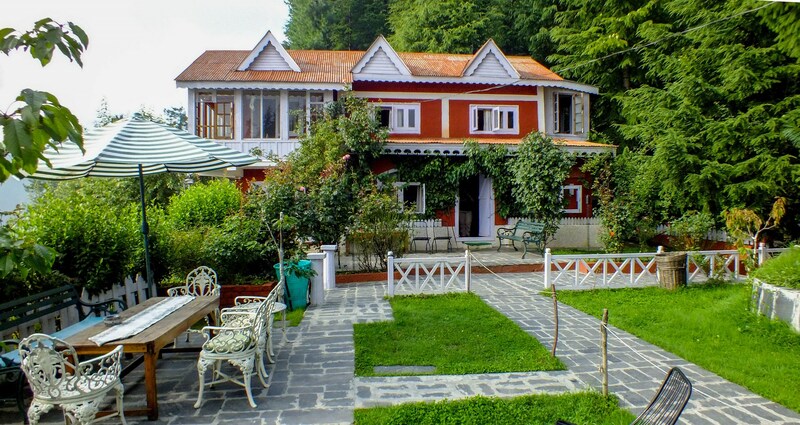 It is a smallish hotel with about 15 rooms, overlooking a lawn garden. The rooms are a little tired now, but the food is exemplary, especially the local Spiti dishes they make. The dining room is combined with a lounge – with a row of computers on one wall, should the hotel guests need internet access. It is a cozy place decorated with rugs, local handicrafts, and even a fireplace at one end. Strewn around are big coffee table books about Spiti Valley, Buddhism, the Himalayas and mountaineering. We always reached early for breakfast or hung around after dinner, browsing through these books. We stayed 2 days in Kaza, making it our base to explore Ki/Kibber and Komic/Langza. 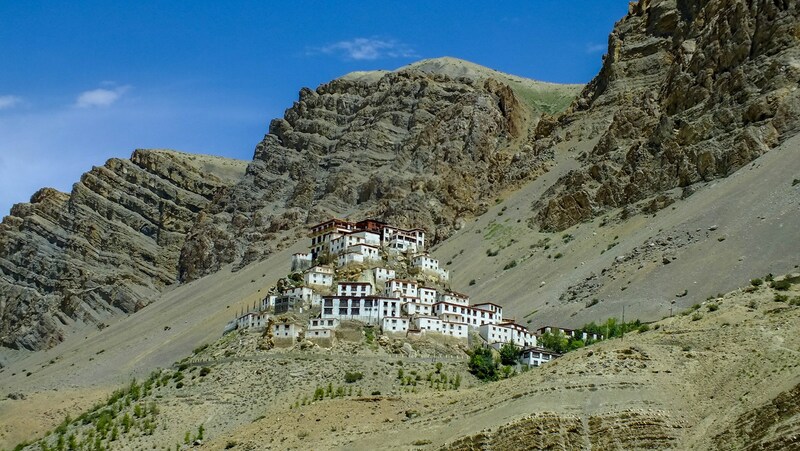 Ki Monastery is the biggest monastery in Spiti Valley, majestically perched on a rocky outcrop, a few km outside of Kaza. It is a learning centre for hundreds of monks, but the monastery itself wasn’t as spectacular inside as Tabo. However, like every monastery we visited, there is the great calmness inside, which quietens all visitors – and drives down all conversation to quiet whispers. Sitting for a while in the prayer room is a very soothing experience, admiring the various thangka paintings and other oddities around the room. The faint smell of incense is ever present too. Kibber village is one of the highest inhabited villages in India, at about 4205m, and is home to another small monastery. The walk to the monastery is slightly long, winding through the village, but the monastery is not a big one and was closed when we reached it. Komic is the highest village in Asia with a motorable road and electricity – at 4,587 m. It is a tiny hamlet with barely 20 homes. There is a big monastery overlooking the village, and this one is built a little differently. The build is more like a castle with rust-coloured thick square walls. There is a separate hostel for monks to stay. We even spotted a volleyball net nearby – sometimes foreign tourists have a friendly match with the resident lamas ! Komic is situated at a high plateau, surrounded by snow-covered mountains – it is a very beautiful place. Well worth the hour’s drive to get to it. Langza is a similar small hamlet at 4,400 m, but not as picturesque as Komic. We headed north towards Losar and Batal on our way to Chandrataal. The road from Losar was quite atrocious, with streams of rivers flowing over the road at a lot of places and only skilful driving by our driver keeping us from getting stuck. The road was basically a dirt track, with no hint of tar. We got a bit of snowfall at Kunzum top, but we did not spend any time there. From Batal, the road is motorable only for vehicles with decent ground clearance. It is also the starting point for lot of treks to Chandrataal. Chandrataal Lake is a crescent-shaped high altitude sweet-water lake (4300m) – and source of the Chandra river (tributary of Chenab). For overnight stay, there are campsites built at a little distance from the lake – Parasol, North Face and Jamaica are the more popular camps. Camp Jamaica is situated right next to the parking lot of the lake, from where the lake is less than a km away. Parasol and North Face camps are situated much further away (about 5km), but they are lower down in the valley, so they are shielded from the strong winds at these heights. And these are not luxury tents with plumbing and beds. These are traditional, small tents, with mattresses on the ground and a common loo. It was really windy when we arrived at Parasol camps in the afternoon. After a quick lunch – very simple affair – we bundled into our vehicle with jackets tightly zipped up and headed towards the lake. From Camp Jamaica, it is a fairly easy walk to the lake, 10 min if walking quickly. The approach to the lake is from high up, so only a sliver of the turquoise waters are visible first. Once you climb down to water level, there is a very pretty walking path around the periphery of the lake. Most of the visitors seemed to be satisfied in just seeing the lake up close and then going back. But the real treasures are hidden for people who make the full 4km walk around the lake. With the late afternoon sun playing hide and seek with the clouds, the colour of the lake kept varying between shades of blue. And everytime the sun slipped behind a cloud, the same pleasant wind would turn biting cold. We walked hand in hand around the lake, pausing frequently for photos and just marvelling at the magnificence of nature. For a long while, we were the only ones around the lake as the day trippers left early. We contemplated waiting for darkness and the moon, but the cold breeze and lack of other tourists deterred us. As it turns out, when we reached back at Camp Jamaica in the evening, a big bunch of foreign tourists were starting for the lake to see the lake at night. But by now we were more than a little tired and we really didn’t see how the moonlit lake could beat the beauty of what we saw. The night was the coldest in the entire trip, in a wind-swept valley in flimsy tents. The hot dinner was a solace, but the trip from our tent to the dining tent was chill inducing. The winds finally died down later in the night, and we were able to catch some sleep. We were up at 5am as our driver had asked us to – he had warned us that we had to cross the streams before snowmelt increased the volume of water. And he was right. If the roads were atrocious the day before, road to Rohtang was unimaginably bad. The dirt track was well marked, but in lot of places the track was composed of just boulders. And the numerous streams flowing across the road ! While they were not very voluminous, owing to the early hour, it was still treacherous as it was difficult to judge if there were any deeper holes underwater. At every stream, our driver would stop the car, walk into the waterstream, to check for any hidden depressions. If he found any, he would try to put a stone or two into it to fill it up. And then we would drive across. Despite all these precautions, our vehicle got stuck twice. First time the driver jumped into the stream, wedged a stone under the rear wheel to give it traction and got us out. The second time, we climbed down and had to push the Innova out of the hole it found itself in. Passengers from another car helped push as well – and thankfully we did not get stuck any more. My shoe and socks got wet, but again, small price for Chandrataal. The road weren’t as bad once we touched Gramphoo, and headed towards Rohtang. Rohtang top still had some dirty snow but more disappointingly, it was crowded like Juhu beach on a weekend. There were hordes of people taking mule rides, ATV rides, or eating from the numerous food stalls. Have to put in a good word about the hotel. 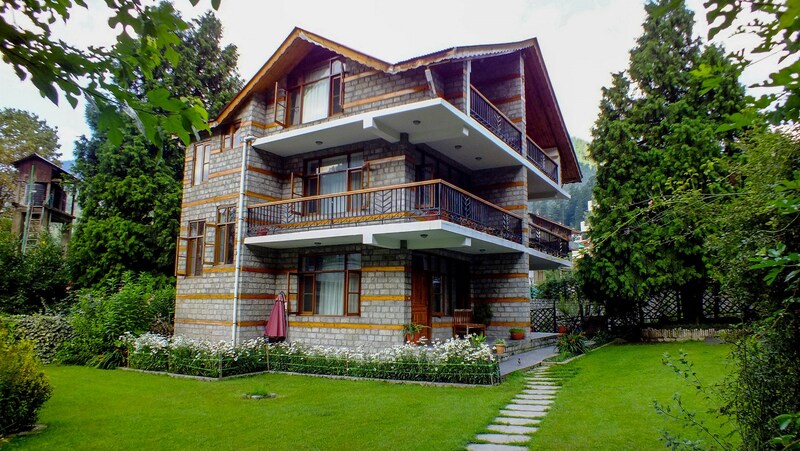 Situated in the heart of Manali, right next to Mall Road, it is a very nice hotel at surprising reasonable prices (Rs 3000). Rooms were huge, bathrooms were fantastic, everything seemed very well maintained, almost new. Their restaurant/bar downstairs is done tastefully in polished wood, is airy – with an attached lounge are as well as option to sit outside in the gardens. The grilled trout I ordered for main course was cooked delightfully and the watermelon feta salad was just like what you’d get in Bombay. Oh and then there was the spa! While as pricey as Bombay, the Swedish massage was the best I have had yet – all Bombay (and other) spas included! All the soreness of sitting in a vehicle for 5-8 hours for last seven days, was massaged out expertly, capping out a perfect day in the hotel. Needless to say, we did not venture out of our luxurious hotel all day. And then it was time to leave it all and go back. Once again our driver insisted that we leave early as the road from Manali to Chandigarh wasn’t the best. While he was being a little overcautious, the roads at some places were quite poor and our average speed for most of the trip quite low. Certain stretches were completely rural roads, passing through small villages etc. Only where we were almost at Chandigarh that we saw four lane roads again. We were in Chandigarh two hours before our flight departure, which turned out to be perfect. Flight was delayed a little, but we were home in Mumbai by 10pm, ending an epic week of travel. Hi, What was the total cost of the trip? Is june a good time to go?